After 20 years, SMSI continues to perform comprehensive security evaluations of Hospital Security programs with the goals of enhanced security using contemporary methodologies and technology. SMSI continues to be informed by our extensive involvement in the provision of our litigation support services. Clearly the goal is the reasonable mitigation of liability through behavior modification techniques, supported contemporary security technology. The SMSI security audit process will quantify a wide range of security vulnerabilities, to find reasonable means to better protect people (patients, visitors, and staff) as well as property. 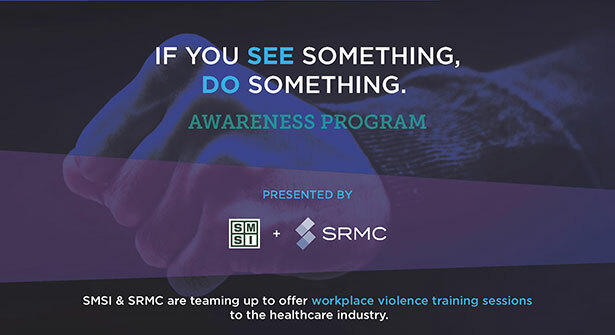 An effective Hospital Security plan must also be rooted in mitigation of workplace violence. Effective security programs must also be data driven. This usually requires the use of contemporary computer based security management systems. Furthermore, SMSI understands the special needs of L&D, the ER, the Pharmacy, Food Service and Housekeeping, to name just a few. With the passage time, effective security programs are net budget neutral. Security solutions offered by SMSI will include the implementation of CPTED (Crime Prevention Through Environmental Design). The absence of CPTED standards, in today’s environment, be construed as falling below a reasonable standard of care. Finally, conducting a comprehensive security assessment on a periodic basis, is far more cost effective than having the court making that assessment as part of a legal proceeding. Remember, security is a situational discipline. This means that the efficacy and adequacy of each security should program is determined by need. Need is largely defined by both the internal and external ambient threat environment. Click to download PDF with more information. 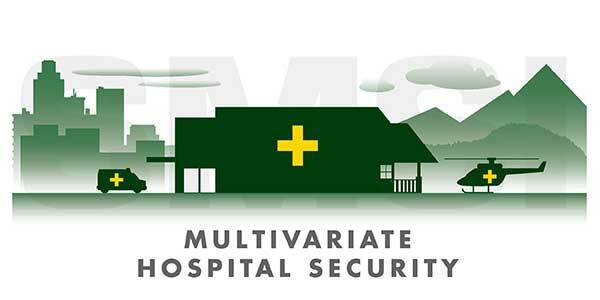 SMSI has provided Hospital Security consulting services such as employee attitude surveys, security assessments, Security Program & System design, and expert witness services to a wide range of Hospital facilities. For the past thirty five years, Hospital Security has been a cornerstone of SMSI’s business, including assessment and security survey services. We have established a track record of excellence. SMSI has been retained by a number of hospitals; some with as few as 30 beds as well as others with well over 500. We have worked with large urban hospitals, as well as small rural facilities. We have provided service to both teaching and research hospitals from coast to coast. Our team also has experience with Level One, Two, and Three Trauma Centers as well as Behavioral Health facilities. 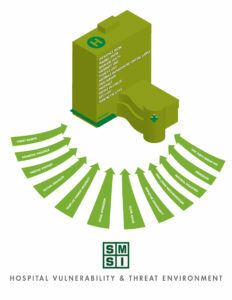 We at SMSI also understand the economics of the delivery of health services in an environment of shrinking resources. This means that the security services required to protect patients, visitors, employees and property, must be delivered as cost efficiently as possible. This may mean security program that are less labor intensive in favor of technology approaches. The good news is that the aggregate cost of technology has gone down in recent years. We at SMSI Inc., challenge you to find a hospital security consulting firm that performs a more complete assessment, survey, design, or expert witness service. We use both quantitative (metric) and qualitative methodologies. We examine the interrelationship between natural and man-made disasters against the backdrop of potential criminality as exemplified by the hurricane Katrina. Our consultants complete technical assessments against the background of behavioral modification. Bill Nesbitt began his healthcare industry career as an 18 year old Navy Corpsman at the Philadelphia Navy Hospital. With the evolving changes in the delivery of healthcare services and an ever-tightening financial environment, perhaps, one of the best, yet untapped, sources of revenue enhancement lies in the hospital’s ability to curtail fraud and stop unchecked losses from walking out every door of the facility. SMSI Inc. knows how to return these losses back to the bottom-line where they belong by enacting strong Hospital Security programs, along with assessment, survey, and design assistance. Another cost-efficient strategy may be derived through the application of current security technology. Over recent years the cost of technology has gone down while its effectiveness has gone up. The application of current technology has also functioned as a force multiplier by allowing fewer security personnel to becomes more productive and targeted. Because Bill Nesbitt and his associates have testified in numerous civil litigations, as Security Expert Witnesses, involving Hospital cases, SMSI has a unique understanding of a wide range of risk factors. This experience has allowed SMSI to gain insight in how to avoid and/or minimize the threat of lawsuits. SMSI’s expert consultants are familiar with the special requirements in Hospital Security and understand how to meet an appropriate standard of care. Our consultants provide assessment, survey, and design services to better meet these requirements, including our Security Management Support program. We are familiar with the standards laid down by OSHA and JCAHO. We can ensure that these standards are met and exceeded. We will also ensure that healthcare facilities that are mandated by state laws to meet certain security standards are in full compliance by implementing our assessment, survey, and design services. Our expert consultants understand the need to address the requirements of the Health Insurance Portability and Accountability Act (HIPAA). SMSI understands the role of security in support of the hospitals Chemical/Bioterroism Plan in a post 9/11 environment. SMSI Inc. also publishes The Hospital Security Reporter, a newsletter that addresses a wide range of security issues that are unique to hospitals. Anyone may subscribe to this online at no charge. Subscribe to The Hospital Security Reporter now. If you are not sure where your Hospital stands, try taking The Hospital Security Diagnostic Test. If you think Security Management Support (SMS) might be part of the solution, try taking the Security Management Support Diagnostic Test. Call or email today and ask for a proposal from our hospital expert consultant team. We also offer Customized Security Training for hospitals as a cost effective way of bringing our information to you and your staff.